Per his military service record (Depot), James McGeechan was born at Lithgow, N.S.W. He gave his age as 27 years and 3 months, his marital status as single, and his occupation as engine driver. His description on his Certificate of Medical Examination was height 5 feet 4 ½ inches tall, weight 127 lbs., with a fair complexion, grey eyes, and black hair. His religious denomination was Presbyterian. He claimed to have no previous military service. He completed his medical examination at Lithgow on 3rd November 1915. He was attested by Lieutenant F. Middenway at Lithgow on 3rd November 1915 (the day the Coo-ees marched from Lithgow to Hartley). His postal address on his initial Application to Enlist in the Australian Imperial Force form was Bridge Street, Lithgow. His next of kin on his Attestation Paper was listed as his stepmother, Bridge Street, Lithgow. After completing the Coo-ee March he went into Liverpool Camp with the Coo-ees. On 17th November 1915 Private McGeechan went before a Medical Board at Liverpool Camp, where he was found to suffer from Hemiplegia, and was unfit for active service. On 22nd November 1915 Private McGeechan was charged with being absent from his post while on guard on 20th November 1915. He was issued a warning. On 29th November 1915 Private McGeechan was discharged medically unfit. Per his military service record (regimental no. 4769), William Charles Ellery was born at Castlemaine, Victoria. He gave his age as 43 years and 7 months, his marital status as single, and his occupation as labourer. His description on his Certificate of Medical Examination was height 5 feet 9 inches tall, weight 168 lbs., with a dark complexion, brown eyes, and brown hair. His religious denomination was Wesleyan. He claimed to have no previous military service. In the Dunedoo Chronicle section of the Mudgee Guardian and North-Western Representative, it was reported that a large crowd farewelled Mr. W. C. Ellery at the local train station, ‘who left by train for Lithgow in the hope of joining Hitchen’s “Coo-ees”’. He completed his medical examination at Ashfield on 11th November 1915. He was attested by Lieutenant F. Middenway when the Coo-ees were at Ashfield on 11th November 1915. His ‘Oath to be taken by person being enlisted’ section on his Attestation Paper was dated from 2nd November 1915 (when the Coo-ees were in Lithgow). On his embarkation roll his address at time of enrolment was Dunedoo, N.S.W. His next of kin was listed as friend, W. Miller, C/o A. Yeo, Merrygoen, Dunedoo, N.S.W. On 8th March 1916 Private Ellery, along with many of the other Coo-ees, departed Sydney on the HMAT A15 Star of England. He arrived in Egypt on 11th April 1916. On 19th April 1916 Private Ellery was transferred to the 45th Battalion at Tel-el-Kebir. On 18th June 1916 Private Ellery left Alexandria aboard the Kinfauns Castle bound for France, arriving at Marseilles on 29th June 1916. Private Ellery served with the 45th Battalion through its first action at Fleurbaix, France in July 1916 then through the battles around Pozieres and Mouquet Farm in August, September and October 1916. On 31st December 1916 the 45th Battalion was training at Flesslers, France when Private Elley was evacuated sick. On 11th January 1917 Private Ellery was admitted to the 8th Australian Field Ambulance suffering Rheumatism. He was discharged on 16th January 1917, and rejoined the 45th Battalion when it was manning the front line in the vicinity of Gudecourt, France. On 23rd April 1917 the 45th Battalion was training at Bresle, France, when Private Ellery was admitted to the 13th Australian Field Ambulance suffering from Chronic Rheumatism. He was discharged to duty on 4th May 1917, and returned to the 45th Battalion on 6th May 1917, when it was still at Bresle, France. On 14th May 1917 Private Ellery was admitted to the 7th Australian Field Ambulance suffering from Chronic Rheumatism. He was discharged on 25th May 1917, and rejoined the 45th Battalion when it was at Neuve Eglise, France, providing working parties in the rear area of the front. On 12th December 1917 the 45th Battalion was training at Haut Allaines, France, when Private Ellery was evacuated sick. On 13th December 1917 he was evacuated to the 9th General Hospital at Rouen, France, suffering from Rheumatic Fever. On 14th December 1917 Private Ellery was placed aboard a Hospital Ship for evacuation to England. On 15th December 1917 he was admitted to the University War Hospital at Southampton, England suffering Chronic Rheumatism. On 9th January 1918 he was transferred to the 3rd Australian Auxiliary Hospital at Dartford, England. On 13th January 1918 Private Ellery was discharged from hospital, and marched into the No. 2 Command Depot at Weymouth, England. Private Ellery commenced his return to Australia aboard the H.T. Dunvegan Castle on 13th March 1918. On 21st May 1918 he embarked at Captetown, South Africa, aboard H.T. Tofua. He disembarked at Melbourne on 14th June 1918. He was discharged medically unfit with chronic rheumatic arthritis on 3rd August 1918. Note: It appears from a newspaper article about his welcome home to Dunedoo on 27th November 1918 that the surname of “Ellery” that he enlisted under may have been an assumed name, and that his surname was actually “Burly” or “Burley”. Australian War Memorial. First World War Embarkation Roll, William Charles Ellery. Per his military service record (Depot), William Arthur Burton was born at Marrickville, N.S.W. He gave his age as 21 years and 7 months, his marital status as single, and his occupation as labourer. His description on his Certificate of medical examination was height 5 feet 5 ½ inches tall, weight 129 lbs, with a dark complexion, brown eyes, and dark hair. His religious denomination was Church of England. His next of kin on his Attestation paper was listed his mother, Mrs B. Burton, 68 Enmore Road, Marrickville N.S.W. He signed his attestation paper with the date 31st October 1915, the day the Coo-ees rested at Wallerawang, before they marched to Lithgow on 1st November 1915. He completed his medical examination, and was attested by Captain Eade, at Lithgow on 2nd November 1915. He claimed to have one month ‘s previous military experience with the A.I.F. but was discharged with pneumonia. However a separate earlier service record (regimental no. 2122) shows that he completed a medical examination at Sydney on 22nd May 1915, and was attested at Liverpool on 30th May 1915, but was discharged after 15 days service with reason for discharge ‘own request – under age’ on 12th June 1915. After completing the Coo-ee March he went to Liverpool Camp with the Coo-ee Detachment. On 22nd November 1915 Private Burton was charged with being absent without leave on 21st November 1915. He was fined one days pay. Private Burton signed a Statutory Declaration on 23rd November 1915 stating that “I am only 17 years of age … having been born … on the thirteenth day of April … one thousand eight hundred and ninety eight”. He was discharged from Liverpool Camp parents request, being underage, on 25th November 1915. NAA: B2455, BURTON W A : Burton William Arthur : SERN DEPOT : POB Marrickville NSW : POE Lithgow NSW, Statutory Declaration, William Arthur Burton, 23 November 1915. Per his military service record (regimental no. 4748), William Cairns was born at Strawberry Hills, Sydney, N.S.W. He gave his age as 26 years and 5 months, his marital status as married, and his occupation as laborer. His description on his Certificate of Medical Examination was height 5 feet 3 ¼ inches tall, weight 131 lbs., with a medium complexion, brown eyes, and black hair. His religious denomination was Church of England. He claimed that he had no previous military service. He completed his medical examination on 2nd November 1915 at Lithgow (when the Coo-ees were at Lithgow), and was attested by Captain A. C. Eade at Lithgow on 2nd November 1915. On 25th November 1915 Private Cairns was charged with being absent without leave. He was fined one days pay. On 22nd December 1915 Private Cairns was charged with being absent without leave for four days. He was fined two shillings and forfeited four days pay. On his embarkation roll his address at time of enrolment was Farr Street, Rockdale, N.S.W., and his next of kin is listed as his wife, Mrs. A. [Alice] Cairns, 31 Junction Road, North Sydney, N.S.W. On 8th March 1916 Private Cairns departed Sydney on the HMAT A15 Star of England, along with many of the other Coo-ees, and arrived in Egypt on 11th April 1916. On 24th May 1916 Private Cairns was admitted to the 2nd Australian Stationary Hospital at Tel-e-Kebir, suffering from Influenza. On 26th of May 1916 he was sent to the Base Details Depot at Helopolis, Egypt. On 2nd August 1916 Private Cairns was charged with being absent without leave from the 1700 Parade and absent from Piquet. He was awarded seven days Field Punishment Number 2. On 6th August 1916 Private Cairns left Alexandria aboard His Majesty’s Transport Megantic bound for England, arriving at Portsmouth later that month. He then marched into the 4th Training Battalion. On 22nd September 1916 Private Cairns left England bound for France. On 24th September 1916 he marched into the 4th Australian Division Base Depot at Etaples, France. He was taken on strength of the 13th Battalion on 6th October 1916 when it was manning the front line in the St Eloi sector in Belgium. On 17th October 1916 Private Cairns was sent to the 13th Australian Field Ambulance sick. On 18th October 1916 he was sent to the 4th Australian Field Ambulance, then to the Division Rest Station. On 25th October he was moved to the 1st Convalescent Depot at Boulogne, France. On 26th October 1916 he was admitted to the 18th General Hospital at Camiers, France. On 23rd November 1916 he was transferred to the 51st General Hospital at Etaples, France. On the 5th of December 1916 he was discharged and sent to the 4th Australian Division Base Depot also at Etaples, France. On 8th December 1916 Private Cairns was charged with Drunkenness and being in possession of spirits on 6th December 1916. He was awarded 28 days Field Punishment Number One. On 23rd December 1916 Private Cairns rejoined the 13th Battalion when it was training at Coisy, France. On 28th January 1917 Private Cairns was admitted to the 13th Australian Field Ambulance with eye problems. He was moved back to the Division Rest Station. He rejoined the 13th Battalion on 2nd February 1917 when it was being relieved from the front line in the vicinity of Guedecourt, France. On 26th February 1917 Private Cairns was charged with when on active service being in Amiens without a pass, and not complying with an order given by a Military Police officer. He was fined seven days pay. On 13th March 1917 Private Cairns was sent to the 13th Australian Field Ambulance suffering Influenza. On 30th March 1917 he was transferred to the 5th General Hospital at Rouen, France, suffering Cystitis. On 16th April 1917 Private Cairns was placed aboard the Hospital Ship St George at Rouen for evacuation to England. On 17th April 1917 he was admitted to the Graylingwell War Hospital at Chichester, England, with Pyrexia. On 4th May 1917 Private Cairns was transferred to the 3rd Australian Auxiliary Hospital at Dartford, England. He was discharged on 14th May 1917, and granted leave to report to the Training Battalion at Hurdcott, England, on 29th May 1917. On 30th May 1917 Private Cairns was moved to the 3rd Command Depot at Hurdcott, England. On 30th June 1917 Private Cairns marched into the Overseas Training Brigade at Pernham Downs, England. On 20th July 1917 Private Cairns was admitted sick to the 1st Australian Dermatological Hospital at Bulford, England. He was discharged on 24th July 1917, and sent to the Convalescent Training Depot. On 6th September 1917 Private Cairns was transferred to the Number 1 Command Depot at Perham Downs, England. On 18th October 1917 Private Cairns was charged with being absent without leave from 1400 on 2nd October 1917 till being apprehended by the Military Police at 1100 on 15th October 1917, and losing by neglect his pass. He was awarded Field Punishment Number Two and fined 28 days pay. On 23rd October 1917 Private Cairns marched into the Overseas Training Brigade at Longbridge Deverell, England. On 3rd November 1917 Private Cairns was admitted to the Sutton Veny Hospital suffering Trachoma. A Medical Report of an Invalid form dated 3rd November 1917 in his file recorded that the disability dated from 4th February 1917 at Fleurs, France, where ‘phosphorus from shells caused irritation of eyes which gradually became worse’. On 9th November 1917 he was transferred to the 1st Australian Auxiliary Hospital at Harefield, England. On 6th December 1917 Private Cairns was charged with being absent without leave from the 1st Australian Auxiliary Hospital from 2045 on 4th December 1917 till 8.45pm on 5th December 1917. He was fined three days pay. On 14th December 1917 Private Cairns was discharged from hospital and sent to the Number 2 Command Depot at Weymouth, England. Private Cairns left England on the H.M.A.T. Runic on 20th December 1917, for return to Australia, suffering Trachoma. 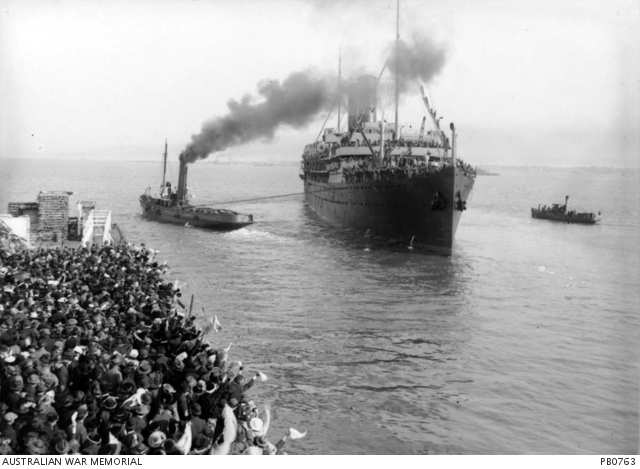 He disembarked at Sydney on 14th February 1918. Private Cairns was discharged Medically Unfit on 13th August 1918. Note: William Cairns died the year after he returned to Australia, at the No 4 Australian General Hospital (Randwick Military Hospital), on 2nd April 1919. He was buried at Gore Hill Cemetery at Gore Hill, Sydney. His name is remembered on the Australian War Memorial Roll of Honour. Per his military service record (regimental no. 4800), Francis Albury Holland was born at Wyong, N.S.W. He gave his age as 22 years, his marital status as single, and his occupation as laborer. His description on his medical was height 5 feet 4 ½ inches tall, weight 141 lbs., with a medium complexion, brown eyes, and dark hair. His religious denomination was Church of England. He claimed that he had 4 months previous military service with the Australian Rifles. He completed his medical examination on the 2nd November 1915 at Lithgow, and was attested by Captain A. C. Eade at Lithgow on 2nd November 1915. On his embarkation roll his address at time of enrolment was Alison Road, Wyong, N.S.W., and his next of kin is listed as his mother, Mrs. L. [Louisa] Holland, at the same address. On 8th March 1916 Private Holland departed Sydney on the HMAT A15 Star of England, along with many of the other Coo-ees, arriving in Egypt on 11th April 1916. On 19th April 1916 he was transferred to the 45th Battalion. On 2nd June 1916 Private Holland left Alexandria aboard the Transport Kinfauns Castle bound for France, arriving at Marseilles on 8th June 1916. Private Holland served with the 45th Battalion in France until 27th July 1916, when he was admitted to the 1st New Zealand Stationary Hospital at Amiens, France, suffering from Epilepsy. On 31st July 1916 he was transferred to the 1st Australian General Hospital at Rouen, France. On 4th August 1916 he was placed aboard the Hospital Ship Marama at Havre for evacuation to England. He was admitted to the 2nd Birmingham War Hospital in England on 6th August 1916. Private Holland was discharged on 13th September 1916, and sent to the No. 2 Command Depot at Weymouth, England. On 17th October 1916 Private Holland departed Portland, England, aboard the H.M.A.T. Ajana, bound for Australia. On 20th November 1916 he was charged with Breaking Hospital at sea on 17th November 1916. He was awarded 24 hours detention. Private Holland arrived in Australia in early December 1916, and was discharged medically unfit on 20th January 1917.